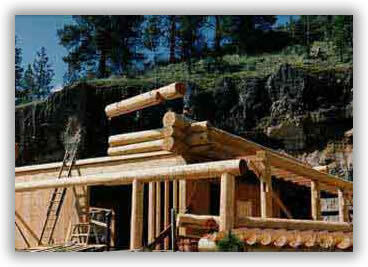 Here are a few guidelines on designing your log home. You may want to save these and refer to them later as they will apply to most of the drawings and designs that we will do on your log home. The square footage of a home is given to the wall centerlines for convenience. The actual square footage will be a bit less. Second floor areas are reduced somewhat due to the lower wall heights and roof slope. Most second floor walls in our homes are about 30" at the wall. With a 12/12 root slope, this reduces the usable room width approximately 2-1/2 feet on each side where the roof meets the wall . Logs to be peeled and hand detailed Douglas-fir logs, 11' - 13' small end diameter graded as #2 or #3 special mill sawlogs. Logs are to be treated with a non-toxic, broad spectrum fungicide to control mold and mildew. We prefer to build with logs that are no longer than 40', which is the longest standard log length in the forest industries today. We are able to obtain logs that are longer, however, they increase the cost significantly and are much harder to work into the design. This is why we prefer to design the building with centerline dimensions of no greater than 34' from outside wall to outside wall. Walls of this length almost always have a log interior mid-wall. For this reason, any wall over 24' center to center should have an intersecting log wall or stub wall for lateral support. These interior walls allow for roof support as well. If a wall must be over 34' center to center, a log mid wall is required and a door will be placed within four feet of the intersecting wall which allows us a area to use log segments that end in the doorway. Above the door header, the wall logs are then spliced in the intersecting wall notch and are bolted end to end so that they cannot pull apart as the wall settle.